Featuring small Italian plates of house-made pastas, Neapolitan pizza, and cheese and salumi, Quartino is one of Chicago’s best stops for those who are in the mood for good Italian fare at an affordable price. Created by Hugo Ralli, Steve Lombardo, and Executive Chef John Coletta, Quartino aims to combine Italy’s best osteria and enoteca to come up with an authentic Italian wine and dine experience. Some of its widely recommended items include the rich duck prosciutto, mortadella, and the fried polenta sticks. All these and more are, of course, go perfectly well with their wide selection of fine wine and other beverages. Quartino is open every day for lunch and dinner until late in the evening. In addition to the items above, the menu also comes with a selection of wines. Items are subject to change. Quartino’s interior is considered a perfect setting for celebrations and gatherings of all kinds and sizes. They can accommodate groups from 10 to 120 guests for lunches, dinners, cocktails, and antipasti parties. Whether it’s for a formal corporate dinner or an intimate family celebration, Quartino can be an ideal choice of venue. They also have special menus for these private events which can be adjusted to best suit the needs of the occasion. For more information about reservations for private dining, call 312-698-5001. 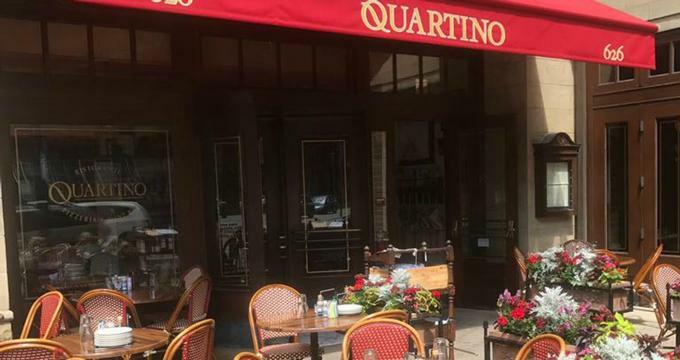 For other inquiries, call 312-698-5000 or visit Quartino’s official website.